JUNGLE GUIDE: ROUTES, TIER LIST, TIPS. Different type of ganks and junglers. Junglers items and their enchatments. What jungle objectives do? Who should initiate during the gank: laner or jungler? As everyone knows, the lol jungle is a major part of each LoL match. The problem with this role is that there are very many people, especially among beginners, who do not know how to effectively play it, being one of the hardest roles in the game. This article will help aspiring new and advanced junglers to improve their play and potentially carry their team to the enemy nexus. Jungler position is most often picked among our pro LoL boosters. Just look at these Junglers at Worlds 2017. They were INCREDIBLE, and they show to the whole world what you can expect from the Jungler in LoL. Firstly, to be able to jungle like a master you have to understand the basics. Many people believe that LoL jungler role means killing the monsters and ganking, but it’s a lot more into it than this. Best junglers in LoL always looking at the map, thinking like the enemy jungler and then thinking about which lane needs your help most, which lane will have the most impact and which lane you can apply pressure to the easiest. If you are new to the jungler role in LoL, you should try to play high sustain champions such as Rammus, Jarvan IV, and Udyr until you gain more experience with the role and feel confident enough to play other champions that play differently. In Season 7, casting Smite on large monsters do not give you any buffs, instead, you will be healed and you will be able to buy a special jungler items, that are available only if you have Smite as a summoner spell. Jungle monsters much differ from the casual minions, they gave levels and never hit you first. During the match, their EXP is growing and max level equals to the average level of the champions. Jungle monsters are promoted in the respawn moment, so if you ignore these guys from the beginning of the game, then they will have a minimal level. The higher monster level – the higher will be a reward from slaying him. 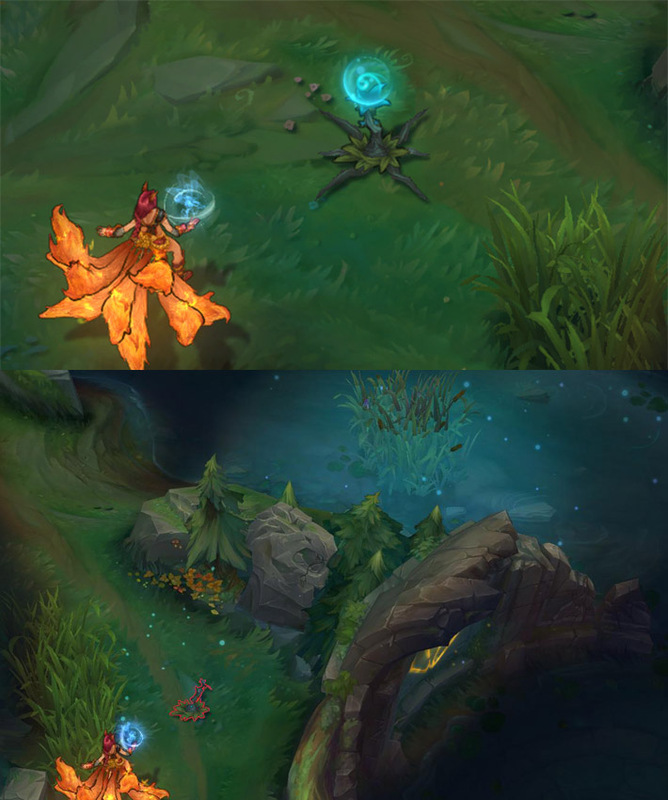 The main jungler objective is receiving of the Crest of Insight and Crest of Cinders buffs. These two kinds of buffs are extremely useful, especially in the first stages of the game, so make sure that you or your allies take them. Red buff or the Crest of Cinders is a great thing that ever jungler dreamed about. Crest of Cinders – for 2 minutes all auto attacks of the champion will debuff an enemy, dealing 4-38 of true damage for 3 seconds, and decreasing the movement speed of an enemy for 10 / 15 / 25% (5 / 7.5 / 12.5% for range champions). Also, it restores 1 / 3 / 9% of the max hp if you fighting against an enemy champion or epic monster. At the early stages this buff if a precious for all junglers, but later Crest of Cinders will be extremely useful for all champions that don’t have good CC abilities. Although, mostly all ADc are range champions, and in this case, the CC from the Cinders will be not as strong as we want, but in any case, the late ADc with the Red Buff will be stronger, than the late Jungler with Red Buff. 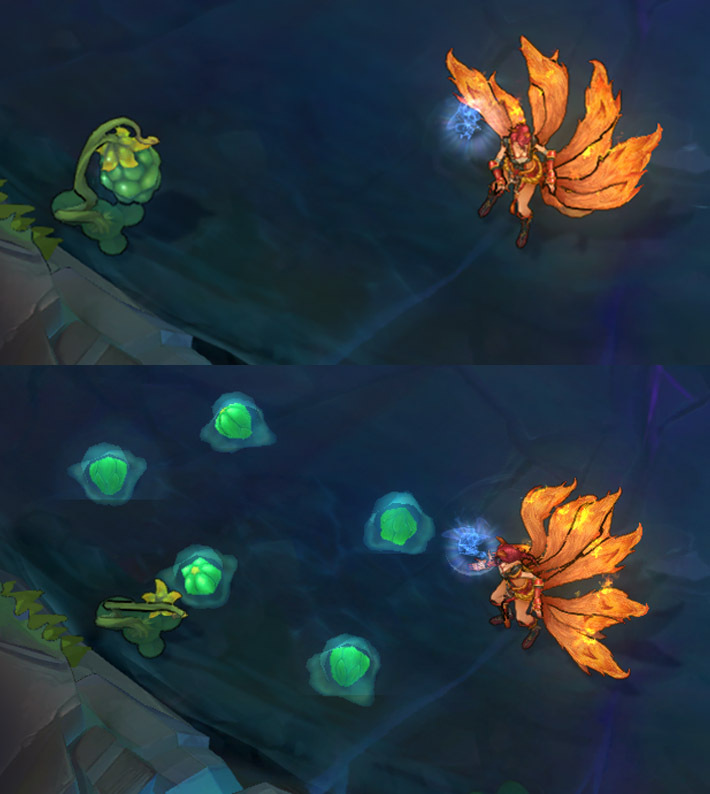 Blue Buff or the Crest of Insight will be useful not only for a jungler. Crest of Insight buff is 2 minutes long, and greatly increase mana regeneration ( 5 +1% from the max mana) and reduce the cooldown on all abilities by 10%. If a champion does not have Mana, then his energy regeneration will be increased (5 + 0.5% of the max Energy). Blue Sentinel is an extremely important monster, and as a jungler you need to track his respawn timer. Blue buff is very strong during the match, so be sure that your team will receive all blue buffs, that available. As I pointed earlier, in most cases you need to share a blue buff with the Mid lane champion to make sure that he will dominate there. Cloud Drake gives Stratus Walk which increases the team’s movement speed by 25 / 50 / 75, but only out of combat. Ocean Drake gives Heart of Oceans which Restores 4 / 8 / 12% of health and mana, but only if you wasn’t been attacked by an enemy champion. Elder Dragon gives Aspect of the Dragon which doubles all previous bonuses and also makes your attacks burn for an extra ([45 x Elder Dragon slain] + [45 x Elemental Dragon slain]) true damage over 5 seconds. This buff lasts only for 120 seconds, and disappear if a champion die. Killing Baron Nashor gives another very important team buff. 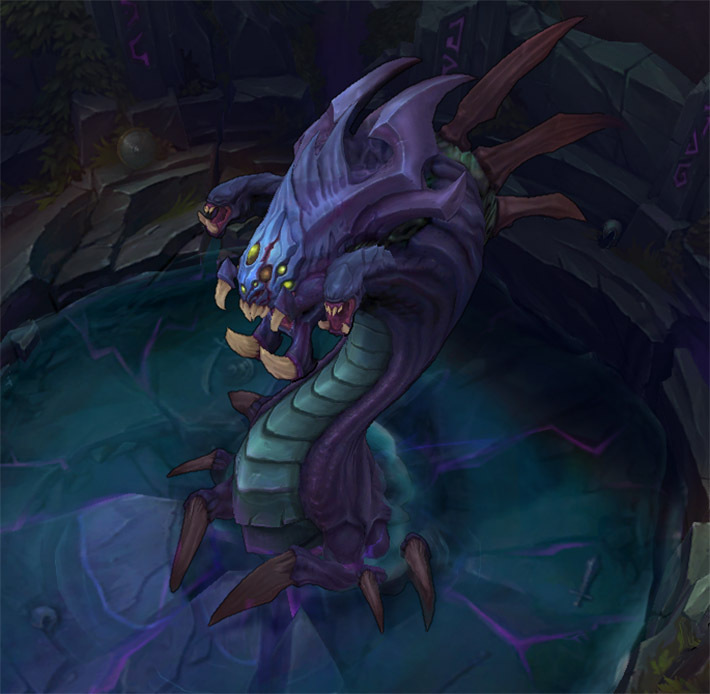 All the team members that are alive when Baron Nashor dies receive Hand of Baron which provides them attack damage and ability power which scale with game time, reduces recall time and when someone with Hand of Baron is near minions they are heavily buffed offensively, defensively as well as gaining movement speed. In the Season 7 were added special plants, that gives you many advantages. 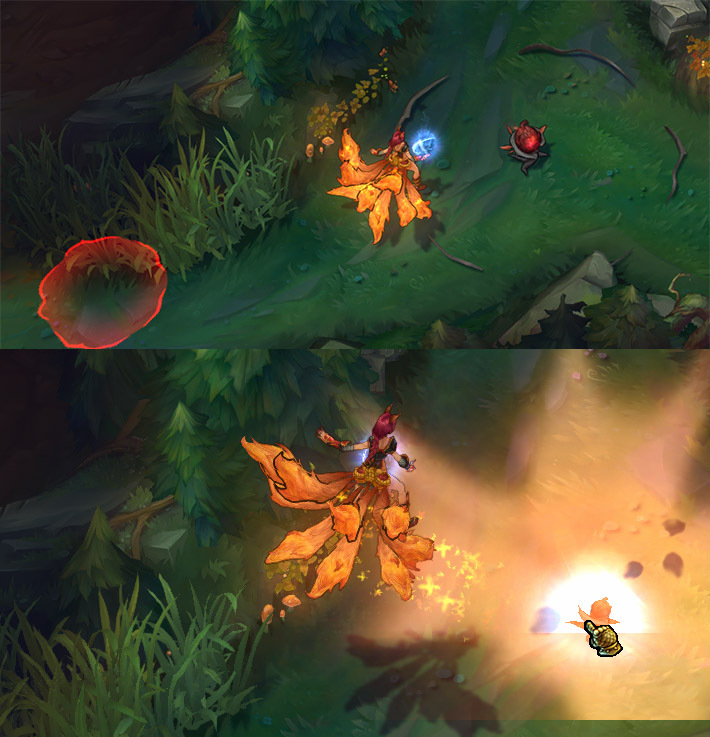 Blast Cone – is a special flower, that explodes when you attacking it and you forced to jump from the explosion. Can be used to cross the walls, or to jump into next jungle camps. Scryer’s Bloom – When this type of flowers destroyed it reveals all enemies in a large cone. Helpful when you scouting for enemies. Honeyfruit – when destroyed it spills small healing fruits, but remember, that they slow you down for a short period of time, so it will be not the best idea to heal up, while you being chased by enemies. As a jungler, you have to manage your time very effectively because you can fall behind very easily. So here I will show you some jungle tips lol. Usually, junglers are level 4-5 when solo laners are level 6 and most of the time the jungler is having the same level as the bottom lane duo. If there aren’t lanes where ganking is available then don’t waste any time and kill the monsters in your jungle or counter jungle if your lanes are pushed to the enemy towers. This will not allow the enemy laners to help their jungler as they will lose farm and thus put themselves behind when compared to your mates. Often it’s more important to give a buff to an ally than to take it yourself. In the mid to late game the marksman needs the red buff more than you do because they need the slow to keep themselves safe from the enemy assassins or champions that dive your team’s backline and the member with wave clear will need blue buff to keep killing the minion waves and not let the enemy team kill towers. Stealing buffs is also important. If the enemy mid laner is a big threat you can focus on stealing their blue buff so that they don’t receive the mana regen nor cooldown reduction. This will put them behind because they won’t be able to use their skills so often and so much. Lane ganking is a tactic that’s approached very usually in higher levels of play because it almost always ensures that you will get something out of it since most people tend to ward river bushes and tribushes. This tactic is usually used when ganking bottom lane because the support takes sweeping lens very early and can also tell you if the bush is warded. Another fact that makes it a great tactic when ganking bot lane is that the support can initiate the gank with their crowd control because often people play supports with a lot of crowd control. 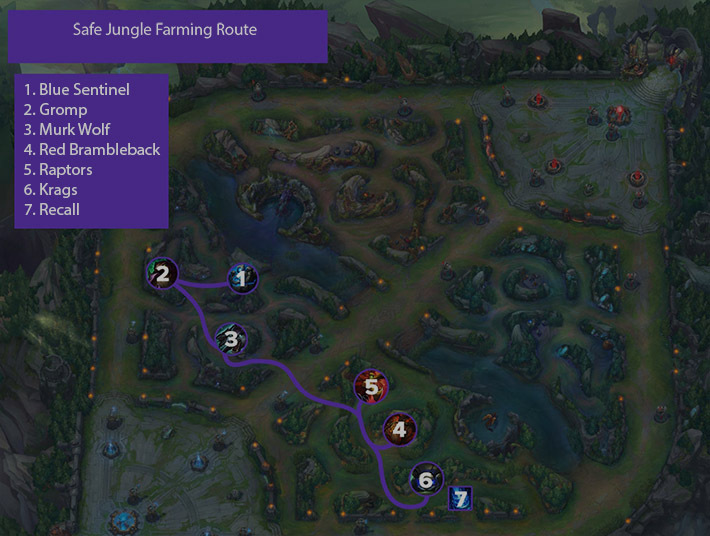 Now that we finished talking about the buffs we should talk about the best jungle route. Usually, junglers start with the camp closest to the bottom lane duo because this allows them to receive as less punishment as possible, but if the jungler is on the red team and the champion has ways of attacking faster then they can start at Krugs. After killing the first camp you should kill the buff wielding camp near it and then either kill the other camp in that area or move to the other buff. Choosing which way to go is determined by how much you need the other buff and on your early ganking possibilities. If, for example, you are playing Lee Sin and just finished killing the Red Brambleback and you see an opportunity to gank mid lane you can kill the raptor camp first to get level 3 and then gank mid. When you do this there is a possibility that the enemy jungler will take your blue buff when they see you on a lane and not in the jungle. You have to think carefully about this because if the gank doesn’t work then you will lose a buff and your enemy will gain one or at least a refresh and you will also waste time because you don’t gain anything. I’ve said things about ganking earlier, but I haven’t touched on what ganks are and what constitutes a successful gank, so this is what will come next. We call ganks moments when champions move from their farming position to another place to kill the enemy champion, the tower or to make them be in a disadvantage by blowing their Flash and thus leaving them exposed to further ganks for the duration of Flash’s cooldown. Usually, ganks are pulled off by junglers, but other laners can also do them. To gank successfully you have to look at the enemy positions and the position of your mates. If the enemy laner(s) is(are) closer to your tower than to their tower then you can try ganking them because it will take awhile for them to get back to the safety of their tower, thus you will be able to deal damage or use your crowd control to slow them down and maybe kill them. If the enemies are rather close to your tower, but there are a lot of enemy minions then you should think if it’s worth losing so many minions to a maybe ineffective gank. If the enemy doesn’t have Flash or any other escape then you or your mate will get an easy kill and your team’s gold will grow as well as the experience. Not getting kills doesn’t mean the gank isn’t successful. Blowing summoner spells, denying many minions, killing a tower or killing a buff-wielding neutral monster are also ganks that are successful. Everything that puts your enemies at disadvantage is a successful gank. Initiating ganks is another important thing. This depends on the scenario. If the enemy is running towards the bush where the jungler is then they should initiate, but if the laner is able to initiate the gank then they will. Generally, the champion that can land crowd control the easiest is the one that initiates the fight because it increases the success rate of the gank. Who takes the kill is a very controversial topic in the lower ranks because laners think that they are entitled to getting the kill so that they can be very ahead, but in reality, it doesn’t really matter who takes the kill. Think of the kill gold as a bonus to make sure that the enemy laner falls behind in experience, minion gold and takes tower damage. Inevitably your team gets ahead after each kill, even if the laner doesn’t get it. Counter ganking means that you gank a lane while the enemy jungler is also ganking it. Usually, counter ganks tend to be successful because the enemy team doesn’t know where you are and might not expect you to come. Also, it’s effective because you and the laner can focus on the target that’s easier to kill and then rotating your target to the others. Counter jungling is the act of invading the enemy jungle and killing their monster camps. The safest way to do this is by waiting for the enemy jungler to show up somewhere. If you cannot counter their gank you can kill their monsters and steal buffs. If you are playing a jungler that can gank very early, at level 2, you can kill your first camp and then go to the enemy buff camp and kill them there or steal their buff. Usually, if the enemies expect this to happen they will start at the buff camp and continue their jungle route, making you waste your time when you try to find them there low on health. The easiest way to counter this is to ward the enemy buff at 1:25~1:30 and see if they are doing the normal route or the route that counters this. When doing this you have to talk to your team to follow you when doing this because the enemy team might be nearby and you would take a lot of damage or die if you are alone. In case you play the jungler who is weaker early then you should ward the bush between your buff and the river because the enemy might try to do this. Warding (you can read about it in details in our warding guide) is the best way to avoid being counter jungled. If you see that the enemies try to kill your monsters or try to kill you, you should talk to your team for help and ward the jungle. If you manage to catch the enemies in your jungle by surprise then you might win the ensuing fight and snowball the game from that. If the enemies counter your blue buff side jungle then smiting the big wolf is a great option because the fact that the spirit will keep them away. Let’s consider jungle items in details. All junglers start the game with Hunter’s Machete or Hunter’s Talisman and 2 health potions. Hunter’s Machete and Hunter’s Talisman can be upgraded two times. For the first upgrade, your Smite will be enhanced, and the second upgrade will increase champion’s characteristics. Tracker’s Knife – gives an ability to place additional wards to control the map. Skirmisher’s Sabre enhances Smite, now it can be cast on enemy champions debuffing him for a 4 second. While you attack the debuffed champion you will deal additional True damage and the receiving damage will be reduced by 20%. Stalker’s Blade gives junglers a good way to close gaps, thus making their ganks more effective, so it’s better on champions who need to get closer to their enemies to deal damage or use crowd control. Skirmisher’s Sabre is great on duelist junglers because affected enemies will dealt less damage and you will deal more damage while also giving a vision of the target, so they will have nowhere to escape. Tracker’s Knife is the worst upgrade to Hunter’s Machete because it literally tells the enemy team that you will be counter jungling and they will be ready to kill you each time you try to do so. 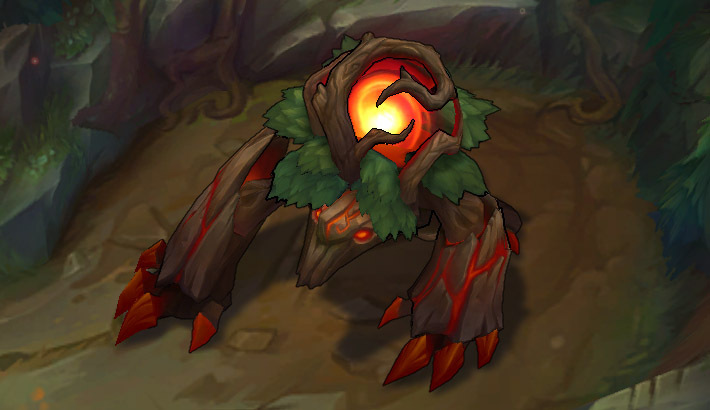 Cinderhulk is an enchantment that increases your health by a flat amount and a percent of it while also deals damage around the jungler. This enchantment is great for tanks. The Warrior enchantment increases your attack damage and gives you armor penetration combined with cooldown reduction. This item is great for duelists. Bloodrazor – each auto attack now deals additional damage that equals to the 4% of the target’s max hp (up to the 75 additional damage to the minions or monsters). Great upgrade that increases jungle farm, and helps during the Dragon / Baron slaying. Runic – accumulate charges when a champion is moving, using abilities. When the charges are accumulated, then next ability will consume all charges and hit up to the four targets, dealing additional magic damage, that equals 60+(0.1*AP). Big monsters receive 250% of damage, and hitting them restores 18% of mana. Always start the game with Warding Totem as it allows you to defend your jungle at level 1 and also help your laners after you finish the jungle. At level 9 you should swap to Sweeping Lens as you will need to clear enemy vision. Buying wards is always important as a jungler. Keeping the river bush that’s near dragon pinked is always a good idea because it offers a lot of information and if it is positioned right, then you can see if the entrance to the dragon is warded. There are more types of junglers, not just one. The biggest categories are farming junglers and ganking junglers. Farming junglers are the ones who prefer to farm, mostly they are tanks, that perfectly initiate combat in the mid and late game. Even though you are playing a farming jungler, this doesn’t mean that you cannot gank or help your teammates while they are laning. For example, some farming junglers are Nunu, Nautilus, and Shyvana. Even though all of them have decent ganking abilities, their ganks are less effective than other junglers’ ganks. You can help your teammates even just by showing up in the lane when their opponent goes aggressive and you know that the laner cannot take them on alone. For example, if you are playing Nunu and your mid laner is playing Varus against Yasuo, and Yasuo goes aggressive onto him, you can show up in lane even if Nunu’s ganks aren’t the best and your position might favor Yasuo’s escape by using his dash. This might save Varus or you could even kill Yasuo. Ganking junglers are the junglers with very good early game and a lot of mobility. 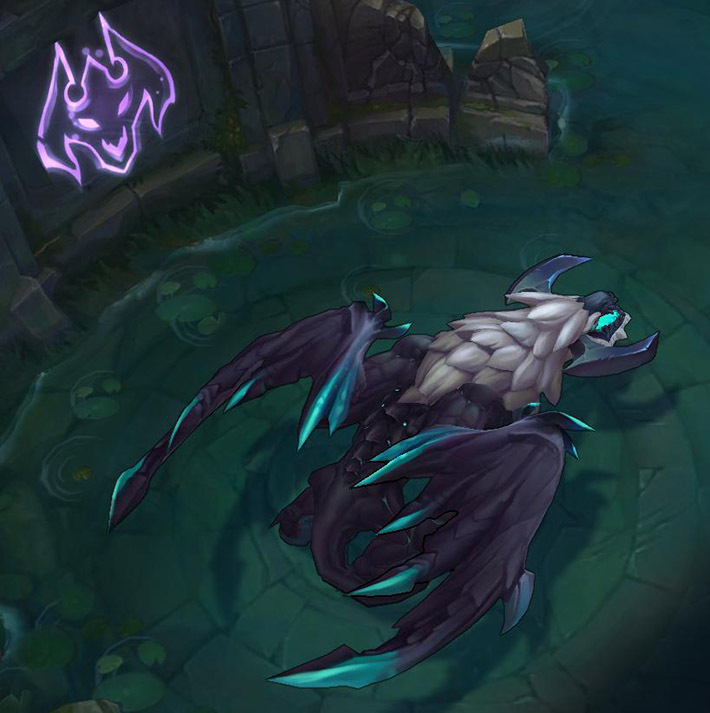 They use these features to earn their team an early game advantage by applying pressure to their lanes and look for the enemy jungler to either counter gank or kill them. Some ganking junglers are Lee Sin, Udyr, and Rengar. Their mobility, early game damage, and heavy crowd control allow them to be very dangerous to the enemy team. All of them are able to pull off high damage ganks from as early as level 3. They apply pressure to lanes just by being in the game because if the enemy team doesn’t have wards they don’t know when to expect a gank so they will play safer and allow your laner to gain more farm or poke them. Maintaining vision control is something that’s very important to junglers. It doesn’t matter which kind of jungler you are playing, you have to either put wards or kill wards. 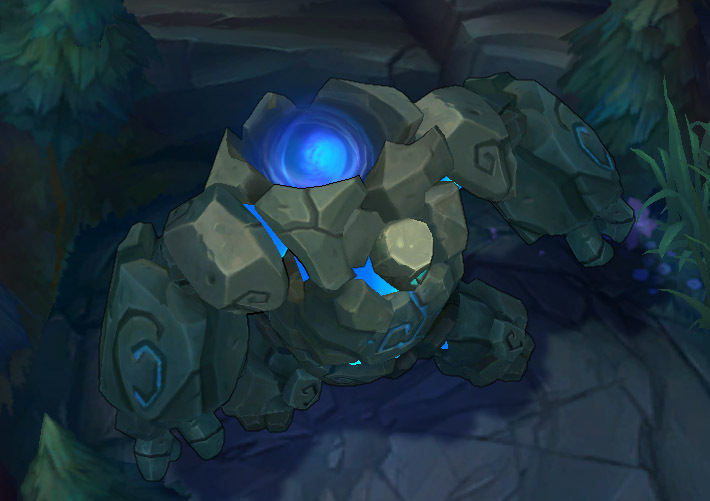 Some more supportive junglers such as Nunu, Sejuani, and Gragas can purchase Sightstone to do better in this part of the game. Yes, I already highlight this question earlier in this article, but I decided to open this issue completely. Playing as a jungle you have three routes of farming, and each of them is different. You need to understand what farming strategy you need to use, like when you need to farm more, of when to perform an early gank. If you need to just farm for the first minutes of the game, then you need to choose this route. This is the perfect option, if all your teammates feeling comfortable at lanes, and they do not need your immediately help. For like four minutes you will clear basic jungle monsters camps, and earn almost Five level. After finishing this route, you can buy items you need, and start to put a pressure on different lanes, take an advantage from the enemy. And a small tip, before you start killing a Red Brambleback, put a ward, just to be sure that you safe. This will greatly help to your top laner because you will see all in the enemy’s jungle and secure your ally from the jungler ganks. The best choice if you see that the enemies have an aggressive jungle champion. 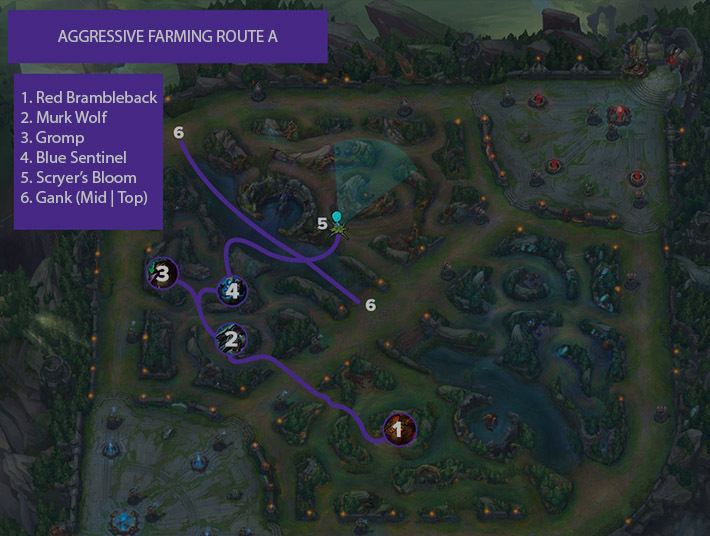 After hitting a plant you can choose where your help is needed, on top or on mid lane. Almost the same, but in this case, we are trying to protect our bot lane. 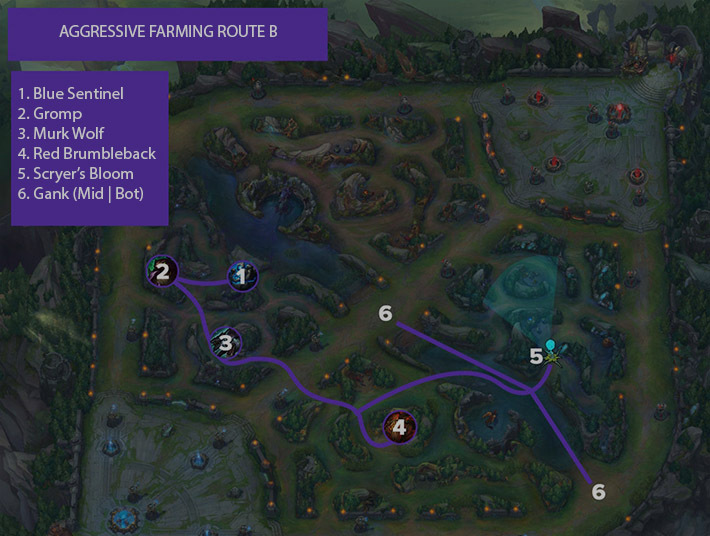 After finishing this route we have a lot of options like we can farm wolfs or a toad camp and only then perform a gank on a mid/bot lane or just rush to help your teammates. In the Season 8 I highly recommend next lol junglers – Rengar, Lee Sin, Elise, and Ivern. The main advantage of these champions is their farming speed. All of them have a decent AOE damage, to clear Krags and Raptors camps, and great ganking potential. Aggressive champions are meta champions in Season 8, while farming and tank champions just cannot open their full potential. According to this Jungler Tier List – the best jungler in lol is Rammus, but other champions like Xin Zhao, Shyvana, Jarvan IV are not too far away from our little friend. So if you want to master the lol jungle, then you need to master one of these champions first. Summing up, I want to consider that aggressive junglers are the most efficient champions, thanks to the new runes in LoL. Best jungler in lol is the ganker one. The one who will always roam between lanes and bring chaos into the ranks of the enemies. In conclusion, to play jungle effectively you have to manage your time very well, maintain vision control and apply pressure. We also would recommend you to read our ultimate LoL guide for beginners. Nice, jungler is my favorite role. Decent review of it. Always loved jungle heroes! this guide is awesome. It’s a really good guide, despite the fact that jungle was reworked :D But it still pretty accurate, but you guys need to remake the SMITE part because smite buffs were removed from the game. And now you guys can buy special jungle items that will greatly increase the EXP you gain from slaying the jungle monsters!